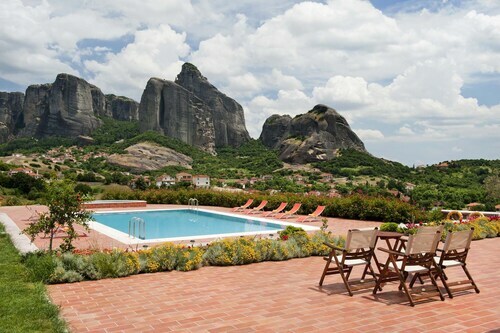 Located in Kalambaka, this family-friendly hotel is 0.4 mi (0.7 km) from Meteora, and within 6 mi (10 km) of Monastery of Agia Triada and Theopetra Cave. Archaeological Collection of Trikki and Trikala Municipal Folklore Museum are also within 16 mi (25 km). Situated in Kalambaka, this hotel is 0.1 mi (0.1 km) from Meteora and within 6 mi (10 km) of Monastery of Agia Triada and Theopetra Cave. Archaeological Collection of Trikki and Trikala Municipal Folklore Museum are also within 16 mi (25 km). 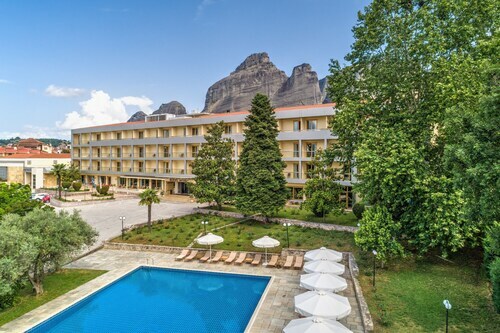 Located in the heart of Kalambaka, this hotel is 0.1 mi (0.2 km) from Meteora and within 9 mi (15 km) of Monastery of Agia Triada and Theopetra Cave. Archaeological Collection of Trikki and Trikala Municipal Folklore Museum are also within 20 mi (32 km). Situated in Kalambaka, this hotel is 0.4 mi (0.7 km) from Meteora and within 6 mi (10 km) of Monastery of Agia Triada and Theopetra Cave. Archaeological Collection of Trikki and Trikala Municipal Folklore Museum are also within 16 mi (25 km). 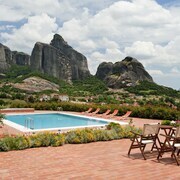 Situated in a rural location, this guesthouse is 1.1 mi (1.8 km) from Meteora and 1.8 mi (3 km) from Monastery of Agia Triada. Theopetra Cave is 5.5 mi (8.8 km) away. 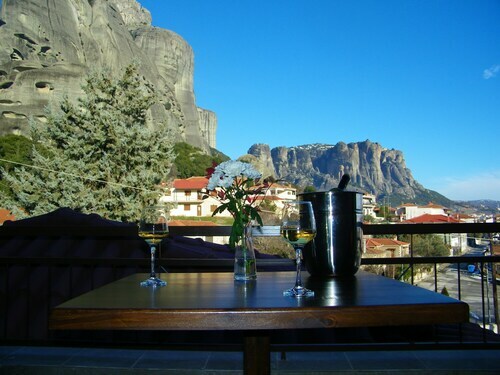 Located in the heart of Kalambaka, this hotel is 0.4 mi (0.7 km) from Meteora and within 6 mi (10 km) of Monastery of Agia Triada and Theopetra Cave. Archaeological Collection of Trikki and Trikala Municipal Folklore Museum are also within 16 mi (25 km). 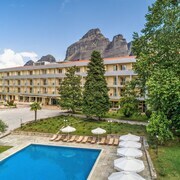 Situated in the historical district, this hotel is 0.1 mi (0.1 km) from Meteora and within 6 mi (10 km) of Monastery of Agia Triada and Theopetra Cave. Archaeological Collection of Trikki and Trikala Municipal Folklore Museum are also within 16 mi (25 km). 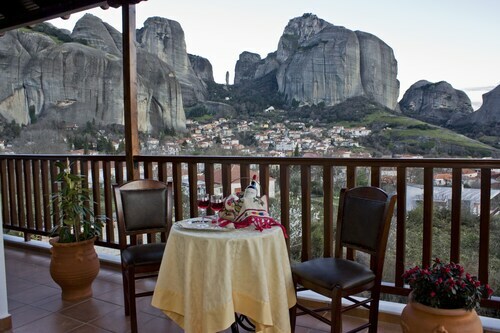 Situated in Kalambaka, this luxury guesthouse is steps from Geological Museum of Meteora and Meteora. Monastery of Agia Triada and Theopetra Cave are also within 6 mi (10 km). 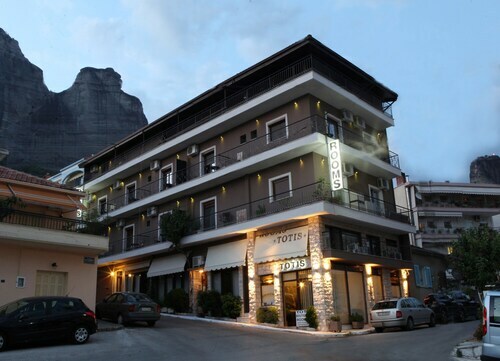 Located in the heart of Kalambaka, this hotel is 0.1 mi (0.1 km) from Meteora and within 9 mi (15 km) of Monastery of Agia Triada and Theopetra Cave. 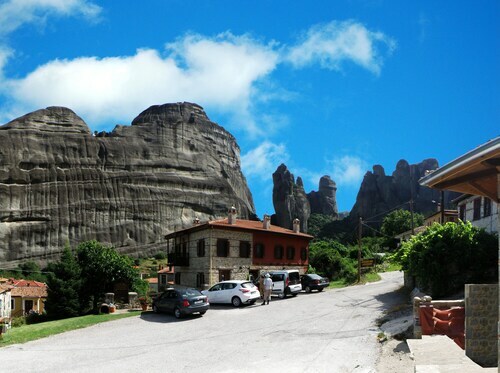 This family-friendly Kalambaka hotel is located in the historical district, 0.1 mi (0.1 km) from Meteora, and within 6 mi (10 km) of Monastery of Agia Triada and Theopetra Cave. Archaeological Collection of Trikki and Trikala Municipal Folklore Museum are also within 16 mi (25 km). How Much is a Hotel Room in Kalambaka? Hotels in Kalambaka start at $31 per night. Prices and availability subject to change. Additional terms may apply. As there are not any Travelocity-listed Kalambaka options within a very close range, we offer a minumum of 28 places to rest your head that are situated just 10 miles (16 kilometers) from Kalambaka. 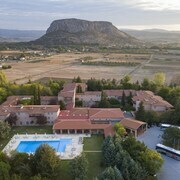 The nearest Travelocity hotel is the Hotel Divani Meteora, Thessalia, situated 7 miles (11 kilometers) from the middle of Kalambaka. As an alternative, why don't you think about the Amalia Hotel Kalambaka, located in Thessalia, which is 9 miles (15 kilometers) away. Those traveling on a budget will be pleased to learn that there's a decent selection of lower-priced hotels and apartments in Kalambaka. 7 miles (11 kilometers) away from Kalambaka's center is the Alexiou Hotel. The Mythos Guesthouse is only 6 miles (10 kilometers) away. 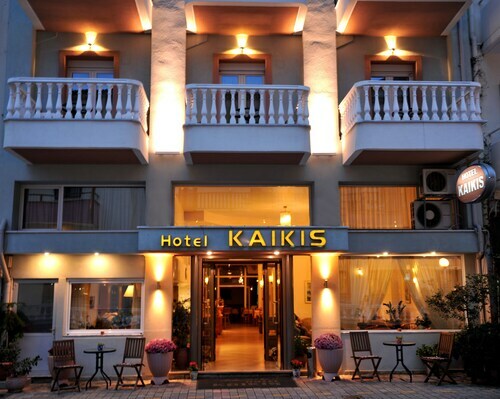 Two other budget-concious options in Kalambaka include the Hotel Gogos and the Hotel Kaikis. 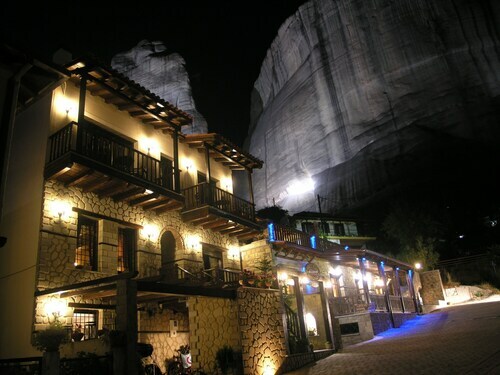 The Meteora Hotel is positioned 5 miles (9 kilometers) from central Kalambaka. On the other hand, the Doupiani House Hotel is positioned 6 miles (9 kilometers) away. 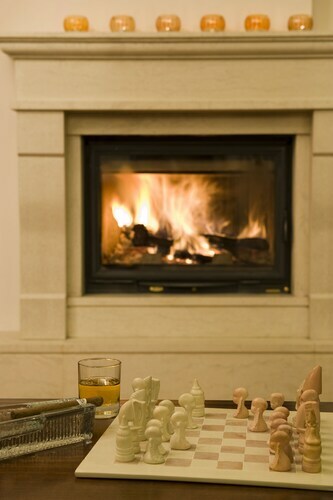 Another possibility is to make a booking at the Iridanos or the Dellas Boutique Hotel. If you have the time, why not spread your wings and visit the many other attractions dotted around Greek Mainland while you're in the region? If you're a nature lover, be sure to explore Greek Mainland's beaches and coastal plains. On top of that, wind your way through a selection of the region's castles. In this area of Greece adventurous visitors may take up the chance to partake in snowboarding. 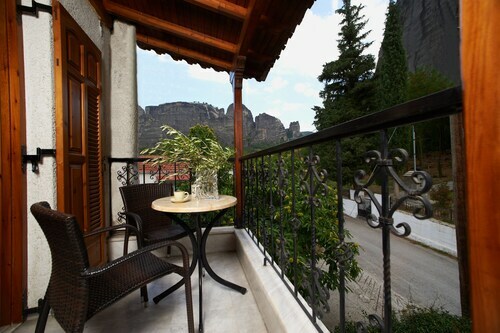 The closest accommodation options in Trikala include Kastraki and Elati. Kastraki is 6 miles (9 kilometers) to the east of Kalambaka, while Elati is 15 miles (24 kilometers) to the east. Lodgings in Kastraki include the Guesthouse Sotiriou and Meteoritis Hotel. The Mikri Arktos and Fretzato Traditional Hotel are some of the hotels in Elati. If you are interested in sport and like to watch games ensure you head to Alkazar Stadium, which is found 50 miles (78 kilometers) to the east of Kalambaka. And travelers that are hoping to find a hotel in the area surrounding the stadium should check out the Divani Palace Larissa or the Larissa Imperial. Ioannina National Airport is a major entry point for those flying in and out of Kalambaka. You can find it 35 miles (59 kilometers) from downtown. For travelers who would like to find Travelocity-listed accommodation nearby, look into Grand Serai Congress & Spa or Hotel Du Lac Congress Center & Spa. Not all rooms were renovated as stated on the hotel’s website. The initial room had a sagging, old mattress & the bed squeaked so much that I thought it was going to fall apart. And that was just by putting my carry on on it! I complained to the front desk about the quality of the bed and room and was upgraded to a renovated room, which was nicer. The breakfast buffet was nice, but was missing fresh fruit. Friends of mine staying at a 3-star hotel had fresh bananas & madarines on theirs. The location of the hotel is excellent. The staff is very friendly. But... The towels were very old. The sheets were not clean enough. The room is spacious and clean. But no one warned that there will be so cold floors. Unfortunately I did not find slippers. Our family of four had an excellent one-night stay at this hotel. The staff was very friendly, the food was good, and the kids loved the swimming pool. The view of the mountains is stunning. Our room was comfortable and clean though the bathtub needed new caulking. 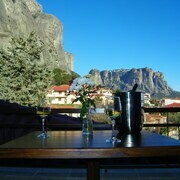 Overall, we found the stay worth the cost, and we enjoyed our visit to Meteora. We enjoyed the views and the lovely hotel and room. We were highly disappointed with ourselves for not having gone to a local taverna to eat that night, because there were several large tour groups that made it expedient for the hotel to offer a buffet. They had the usual Greek selections of salads and desserts, but the hot buffet proved well overcooked, though we arrived right when it opened. The groups were polite, and there was certainly enough food, just overcooked or dried out. Having been through various parts of Greece already, we were used to seeing ripe tomatoes, freshly cooked food (though we'd not had a buffet on other parts of the trip, except at breakfast. We at least expected some nice grainy bread. Breakfast was similar, including no grainy bread, just white bread and white rolls, as well as left over dessert from the night before. Staying was nice, but not eating. Put on your walking shoes and hike the kilometer or less to a taverna. Kalambaka is filled with services for people visiting the monasteries. Alsos House was centrally located (once we found it:)), with a lovely view. It was off-season and we got an upgrade for a small price increase, so had a kitchen and living room and balconies and a beautiful bathroom. Breakfast was included. It was basic, but had plenty of coffee and saved us having to find a place. I would stay here again. Can not say enough about Meteora. Beautiful place. Hotel was very accommodating and had beautiful views. Would definitely recommend both restaurants close by. Food was fabulous. The hotel staff was very nice and helpful.